While not the most common reason for patients to visit a Seaside family dentist like Dr. Santos, experiencing an uncomfortable toothache certainly ranks as one of the most pressing reasons to schedule an appointment. 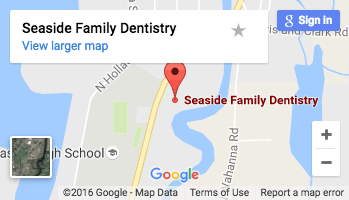 When to Visit a Seaside Family Dentist? The proper identification and receiving the proper treatment for a toothache related to an oral infection is vital to preventing the infection from spreading to other parts of the body. If an oral infection spreads to the brain or the bloodstream it could become fatal. How Does Dr. Santos Treat a Toothache? To properly treat a toothache, Dr. Santos will first need to conduct a physical exam to determine the underlying cause. He will start by asking a few basic questions about the type of pain you’ve been experiencing, where the pain is located, what makes the pain feel worse, and what makes the pain feel better. As part of an oral exam, Dr. Santos will examine your mouth, gums, teeth, jaw, tongue, throat, ears, nose, neck and sinuses. X-rays and other additional test may be needed to correctly identify the cause of your discomfort. How a toothache is treated depends on what’s causing the discomfort. If a cavity is the cause of your discomfort, Dr. Santos will correct the issue by filling the cavity or, in extreme cases, removing the tooth. Toothaches that are the result of a nerve issue may require a root canal to treat, while toothaches the result of an oral abscess may require draining and cleaning out the infected area. Depending on the severity of an infection, an antibiotic may be prescribed. Since the most common cause of a toothache is dental decay and disease, the easiest way to prevent one is to practice quality oral hygiene at home. By brushing and flossing daily, you can significantly reduce the buildup of the harmful oral bacteria most responsible for cavities and gum disease. No one wants to experience a toothache, but if you do, know that the team at Seaside Family Dentistry will provide the quick and compassionate care you need to feel your best.